Find the newest 130 N Garland Chicago Loop condos available for sale and the best real estate listings in Chicago for viewing. The Heritage is a condo building located in Chicago, Illinois that offers a wide range of amenities to fit any lifestyle. 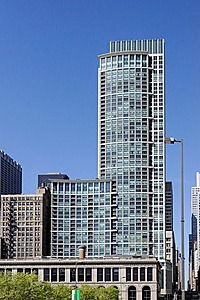 See today's 130 N Garland condos for sale & 130 N Garland real estate property listings below. Browse our Chicago condos, lofts, Chicago penthouses and Chicago highrise condos for sale by location, size or price and let this website be your regional real estate guide. We would love to be your Chicago real estate agents and assist in the condo buying process. For information about condominiums available in 130 N Garland or to schedule a private showing, contact your local Chicago Loop real estate experts today. Read more about 130 N Garland real estate. Purchasing a condo at 130 N Garland? Call 312-810-6693 to reach your local 130 N Garland real estate team, Guarnero Group Compass. Our experts will offer guidance to help you through the Chicago Loop real estate market. Located just off Michigan Avenue at 130 N Garland, The Heritage at Millennium Park is in the heart of Chicago's dynamic Loop neighborhood. Situated just behind the Chicago Cultural Center which has landmark status, the unobstructed views of Lake Michigan, Millennium and Grant parks and the Chicago skyline enjoyed by residents of The Heritage are permanently protected. Constructed in 2005, the Heritage is not only the tallest residential condominium building in the Loop, towering 57 stories in the sky, but is arguably the most handsome one as well. Its sophisticated brown and creme, two-tiered facade is not only attractive but is also truly distinct, demanding the attention of passers-by. Elegant and contemporary, The Heritage provides luxury urban living at its finest. The 356 individual condominiums found at The Heritage boast only the finest of finishes but vary depending on the unit. Spacious and sun-drenched, these dog-friendly units come in a variety of layouts that cater to a range of needs. Gourmet kitchens and unbeatable views are standard throughout the property. The Heritage was also integrated into the city's pedway system which means that residents have secure access to a variety of retail stores and businesses, including Macy's, Starbucks, the Daley Center and CTA and Metra lines. Other building amenities include a first-rate fitness center, a stunning indoor pool with whirlpool, a sundeck, party room, dog-walk and 24-hour doorman for residents' convenience. In addition to the sundeck and patio on the pool level, The Heritage also offers a gorgeous roof-top terrace on the 28th floor that provides the perfect vantage point from which to soak in the stunning panoramic views of the lake, park, Navy Pier, fireworks and cityscape. While the 130 N Garland condos in Chicago undoubtedly provide residents with an uncompromising lifestyle of luxury, it also offers them an unbeatable location. Across the street from Millennium Park and down the street from Grant Park, residents are perfectly positioned to take advantage of the multitude of concerts, festivals and events hosted in these green havens over the summer months. The Heritage is also just across the river from all the famous, world-class shops that line Michigan Avenue. Museum Campus is less than a ten-minute walk south while Chicago's Theater District is five minutes west. The lakefront as well as the Chicago River could hardly be closer and State Street shopping offers a nice alternative to the Magnificent Mile. Public transportation options abound but won't be needed for morning commutes since The Heritage is a true walk-to-work building. Planning to buy or sell a home in 130 N Garland? Let our local Chicago Loop real estate team guide you through the sale of your current 130 N Garland condo or purchase your next 130 N Garland property. As The Heritage real estate agents and real estate agents, we're well-versed in the unique market dynamics of Chicago IL real estate. We're ready to work with you today! Contact Guarnero Group Compass to learn more about representation for buyers and sellers. Preparing to sell your The Heritage condo? View our comparative market analysis page to receive a free 130 N Garland property evaluation within moments.